George is a great puzzler, so I was extremely surprised when he didn't immediately know the answer to a really famous puzzle. It's a puzzle that you probably did years ago, and have heard so often you can do it from memory rather than working it out. It's also not really that difficult, so I was also surprised when it appeared to be stumping him. "Come on, surely you know this one." I said. "I don't. And don't call me Shirley." He answered grumpily. I could tell his mood was declining rapidly, but like any great puzzler he was down and not out, and I watched his facial expression change as he reached into his mental bag of tricks. He nodded towards a conveniently located white board. "Have you got a marker for that?" He stepped back, admiring his work, beaming proudly. "Well, now the solution is very obvious!" he commented. A man has to get a Fox, a Chicken, and a sack of Barley across a river. He has a rowboat, and it can only carry him and one other thing. If the fox and the chicken are left together, the fox will eat the chicken. If the chicken and the barley are left together, the chicken will eat the barley. How does the man do it? All nodes in the graph represent all the LEGAL states in the puzzle (where nothing can eat anything else). 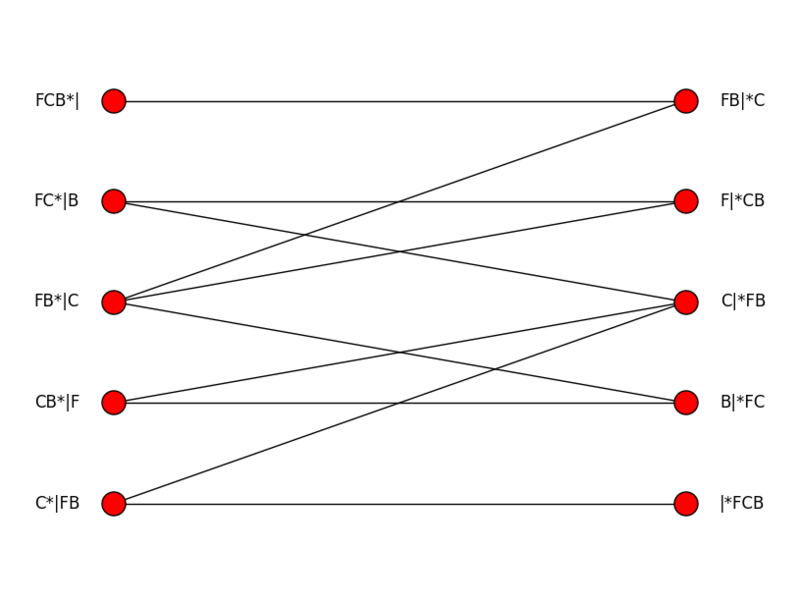 Each line between each pair of nodes represents a single move (i.e. the man crossing the river). F represents the Fox, C represents the Chicken, B represents the Barley, * represents the man, and | represents the river. The puzzle starts at the top left node, and the goal state is at the bottom right node. A man, a chicken, and a fox?